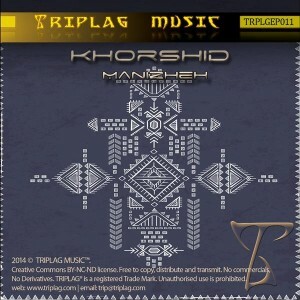 Triplag Music is proud to present the dark, fast, and furious debut from Khorshid, Manizheh. Behind this project is Shahin Hooshyar, a Persian musician based in Denmark who produces good quality dance music. At a very early age he was playing the keyboard and experimenting with synthesizers, trying to find himself through music. Now with a musical background of over 18 years he brings us mind-bending audio to transform your soul and enhance your spirit. Drawing influences from various artists around the globe and life itself he takes you through landscapes of deep cinematic sounds and dark atmospheres with razor sharp leads. This is very potent and powerful psychedelic dance music! Tracks 1, 3, and 4 mastered by Heaven and Hell Studio; track 2 mastered by Kashyykk Studio. MP3 Download | FLAC Download | WAV Download · Download count: 9,190. I was looking for fast and truly dark psytrance, without the cheap samples I usually find in hi-tech and so-called darkpsy chaos…this is were I’ll stop my quest, nothing can be as well thought and detailed as this. THANKS, from the bottom of my soul, I hope this guy will keep producing in that way. Wonderful! Track 2 is crazy and track 4 is insane. Thank you!